On December 15th, 2014, racing legend Rod Hall pulled his championship Bronco from the Off-Road Motorsports Hall of Fame (ORMHOF) museum in Reno, Nevada, and into the shop for a full restoration. This April, Hall, who has achieved more podium finishes that any American off-road racer, will slip behind the wheel and again pilot his classic steed down the Baja peninsula in the General Tire NORRA Mexican 1000. 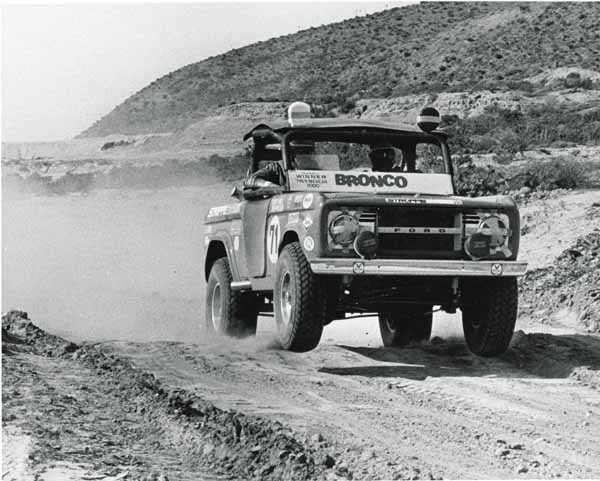 The Bronco, which was built by Bill Stroppe, has a past as storied as Hall himself. After Hall and teammate Larry Minor drove it to an overall win in the 1969 Mexican 1000, it was sold, raced, resold, and then retired to a wrecking yard in Southern California. Half buried in sand and nearly forgotten, it was discovered by a local race fan and put on display in front of a Denny’s restaurant. In 2003 the Bronco was donated to ORMHOF and found its way back to Hall. Samco Fabrication will manage the arduous task of restoring the vehicle back to its original glory; which will include a crate 302 from Ford Racing, BFGoodrich tires, and products from Summit Racing, Mastercraft Safety, KC HiLiTES, and Fox Racing. ORMHOF, a 501c (3) non-profit, is dedicated to honoring the rich history of off-road motor sports and those who have crafted it. For information on how you can help put this historic Bronco back on the track, go to www.ormhof.com or follow the team’s Facebook page, ORMHOF Rod Hall Ford Bronco Project. Photos courtesy of Trackside Photo.